What happens to the Underworld if Hayden is no longer it’s god? An old enemy of Zeke’s returns, threatening not only Hayden and Hartley’s relationship, but the very existence of the Underworld. When Hayden can’t protect her, Hartley’s forced to put her trust into the last place she ever expected and do the unthinkable to save everyone. Secrets are revealed, hearts are broken, and lives are turned upside down in this final installment of the Divine Darkness series. 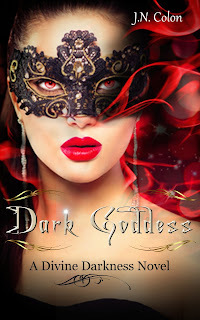 Will Hartley be able to harness the darkness within and become the dark goddess? Or will the Underworld fall apart—taking Hayden along with it?